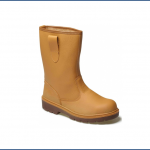 Dickies Super Safety Lined Rigger Boots are a must have for the winter or colder working conditions. The synthetic fur lining provides warmth and comfort in any cold climate (there is also an unlined rigger alternative available). These rigger boots benefit from steel toe-caps as well as steel midsoles for underfoot protection amongst other features detailed below. Like this Dickies Lined Safety Rigger Boot? Then why not click here to check out our wider range of men’s clothing and footwear.